Perhaps one of the least interesting matches in Primera Division this weekend will be played in Granada, where the local team welcomes Levante. They are separated by just three points in the standings and they have a safe cushion ahead of the relegation area with no chance whatsoever of playing in a European competition next season. This safe distance from both areas of interest make this a rather dull affair and many punters are contemplating the possibility of betting on the draw. Granada is in better form and they used to know how to extract maximum value from those games played in front of their fans. It definitely helps that the visiting team hasn’t won many games recently and bowed before some of the weakest teams in the league. Celta Vigo and Betis made short work of their defenses and got away with all six points, despite the fact that they are both in miserable shape. 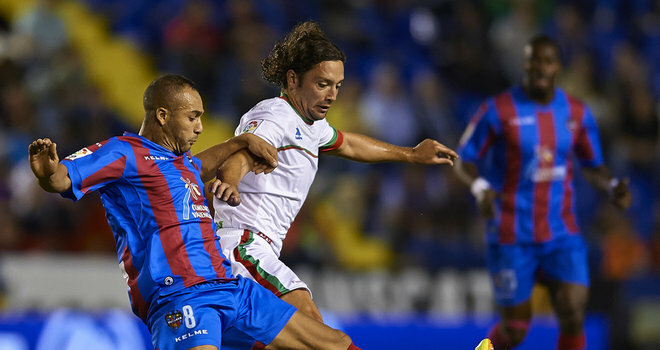 Levante squandered manypoints in March, but they were fortunate enough to have their contenders struggling over the stretch. There is no pressure whatsoever in winning games, especially those played on the road and that’s why coach Caparros uses a single striker. It comes as no surprise that he prefers David Barral match after match, as this gifted forward has the most goals scored for Levante. Naturally, he will receive plenty of attention from the home team tonight and this will make it very difficult for him to send dangerous shots at the opponent’s net. By comparison, Granada will be pairing El Arabi with Riki and it is quite possible for Ighalo to join them in the second half if the hosts fail to score.